Strawberries are my absolute favorite fruit in the world! They are so delicious and healthy for you! I’m so happy strawberry season is here (even though in California they grow them year-round! ), because the grocery stores have been stocked with boxes upon boxes of fresh organic strawberries. I love getting them at the Farmers’ Market when I have time to make the trip. This fresh strawberry orange smoothie is one of my favorite smoothie recipes. It’s simple, yet so delicious! It reminds me of this smoothie place in the mall I used to go to growing up, where my mom, brother and I would always get the strawberry smoothie – it was amazing. I could always tell there were oranges in it and I just loved the subtle citrus taste they gave to the smoothie. Smoothies are the perfect breakfast to start your day since they’re light and won’t weigh you down and make you sluggish. 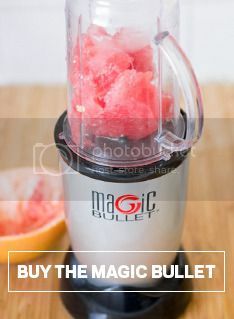 Place all ingredients in the large Magic Bullet cup and blend until everything is chopped up and smooth. This morning I made this blueberry breakfast smoothie with fresh organic blueberries. I always mix in some frozen fruit when I make smoothies because I like the texture better (sometimes if you use only frozen fruit it becomes extremely cold and hard to drink). This blueberry smoothie is a great, healthy way to start off your day. Blueberries have numerous positive health effects, and putting them in a smoothie is the best way for me to get them in my diet. I love adding granola and fresh fruit on top and eating some of the smoothie with a spoon. Don’t forget the whipped cream! I know it isn’t the healthiest thing to do, but lately I have been putting whipped cream on everything. It just makes everything taste better! 1. Add all ingredients to a Magic Bullet cup and blend well. 2. Top with whipped cream, granola and fresh blueberries. Banana in a smoothie? Sure. But Dates?! Could it be? I’ve never really had dates, but I tried them and I liked them. Then I made the Sprouted Kitchen’s Coconut Banana Date Shake and now I think I might love dates. 1. Throw all said items into your Magic Bullet. It’s really that easy. 2. Pulse until it’s reached your desired consistency. And then take it and enjoy it anywhere you go! If you’re looking for a great energy boost in the mornings or at lunchtime, this kale smoothie will surely do the trick! I have to admit, I completely despise eating kale. I’ve tried it in a few different recipes and did not like any of them. I know kale is incredibly healthy, but even when I buy it at the grocery store, I cringe at the thought of incorporating it into a meal each day it sits in my fridge. I know there are some people out there who love kale, even in the raw, but the only way I found I can incorporate it into my diet is smoothies. I created this delicious berry kale smoothie because it allows me to eat (drink?) kale raw, which preserves the nutrients as opposed to cooking it. I can barely tell I’m eating 1/2 cup raw kale in just one 8 oz smoothie. The yummy strawberries and raspberries hide the taste and with the Magic Bullet, you don’t notice a difference in texture. Add all ingredients to the Magic Bullet cup and blend. In a previous post, I made some homemade Nutella, so I thought I would put it to good use and blend it into a smoothie. Then I could take it with me! I used a recipe from Mother Thyme, but you could really just use your favorite items for a smoothie. Throw all said ingredients into your Magic Bullet and blend until your desired consistency has been reached. I headed back to California for the holidays and was able to avoid most of the sleet action happening in NYC. And while my comrades were battling slush, cold winds, and rain to get anywhere, I was lucky enough to be enjoying the sunshine and eats of southern Cali. This smoothie is quintessential California to me–save the wheatgrass shot. Grab your favorite tropical and summer fruits. I saved some strawberries and froze them for an occasion such as this. Sometimes, you just need summer in the winter. Add vanilla ice cream and some fruit juice–I had mango juice–but you could do it with OJ, apple juice or anything that sounds good to you. Place in your Magic Bullet and blend! And then give it to the nearest person because they will enjoy it. And it’s always nice to share. In this case, it was my niece’s cousin, Amy, she loved it. Obviously. One of my favorite recent discoveries is Horchata. I had never had it before, but I tell you, there’s almost nothing better than sitting in the sun sipping on a giant glass of horchata. And now I can make my own! My quality of life just got so much better. Just note, you have to start this recipe three hours before you want it, because there’s a wait time! 1. Pour the rice into the Magic Bullet cup and fill most of the way with water. 2. Blend until the rice begins to break up. 3. Mix with the rest of the water in a large pitcher. 4. LET THE MIXTURE SIT FOR THREE HOURS. 5. Strain the rice water into a pitcher and discard the rice. 6. Add the milk, cinnamon, sugar, and vanilla extract. 7. Stir well and chill before enjoying! BOOSTER. JUICE. More like, I’m gonna boost ya’ WITH this juice. No, I won’t be stealing your car again. Yes, I will be making your life better, your body happier. And yes, this sure as heck will help get your tush in gear. Fire up that Magic Bullet Blender, baby. We got fruits. We got veggies. We got almond milk. All natural. No preservatives. No nonsense. Toss some brown rice powder for added PROTEIN. The boyfriend Aaron and I made this concoction for the first time while I was up in Canada in October, hence the added brown rice powder for additional protein. We used raw, plant-based protein powder – the brand was Sunwarrior. Google it. (No I am not promoting products – it’s just legit and very good for you). I wanted to explain that added protein, because I know if I read that note above and then saw a picture of a broad like me. who openly talks about how she wishes they made camel packs for melted cheese, I’d be judgmental, too. On that note, Thanksgiving has left me resembling a bloated, hybrid version of Antonio Banderas and Frida Kahlo, so you can bet your bullhorn that I whipped out that Magic Bullet Blender this morning and toted some of this liquid gold to work. 1. Add all your ingredients to the blender pitcher. 2. Add water and fill to about to about ¾” from the rim. 3. Blend for 10 seconds. Check. Blend a bit more if you’d like. You’re done. Talk about covering all your nutritional bases in one shot, eh? Ever hear that song by Crystal Waters? 100% Pure Love? No? I pasted the link below for you. A. What you are drinking. One hundred percent PURE love. Until next time, my little protein pioneers – do yourself a favor and get’cha Magic Bullet on. Ugghhhhhhhh don’t you just love fall? I wouldn’t know. I’ve never experienced the season. I suppose that’s not entirely true. But I kind of live in Hawaii, which is kind of summer all the time. I’m not complaining. But I love the idea of fall. Mostly I love the idea of pumpkin. So let’s talk about it. Everyone loves pumpkin, apparently. Although I really wish it were spelled ‘punkin’ like how your aunt mildred or someone probably used to call you growing up. And you totally hated it, but now you totally say it like that all the time. And when you become an aunt [or an uncle], you know you’re totally going to call your nieces and nephews ‘punkin.’ This has nothing to do with anything. Have a drink. Dump it all in your Tall Cup and blend the heck out of it with your cross blade. It’s the best thing ever. And there’s no ice to water it down because your ice is coffee. GENIUS, I tell you! The only thing that would make Elvis Presley more proud of this milkshake would be to add bacon and deep fry it. I always liked the King’s tunes, but what really caught my attention early on was the profile of what he ate. Apparently his favorite sandwich was a giant loaf of bread, hollowed out, slathered in peanut butter and chocolate, with slices of banana and bacon, deep fried. Since it’s too much work to fry up a pound of bacon at 11 PM, I made this milkshake that reminds me of that fabled sandwich. Grab a jar of peanut butter, a carton of ice cream, two bananas, and some milk. Now scoop three generous scoops of ice cream, a heaping spoonful of peanut butter, add sliced bananas, and douse with some milk. Nevermind what it looks like at this stage. And it’s especially delicious if you eat it while wearing Mario Kart pajama bottoms.